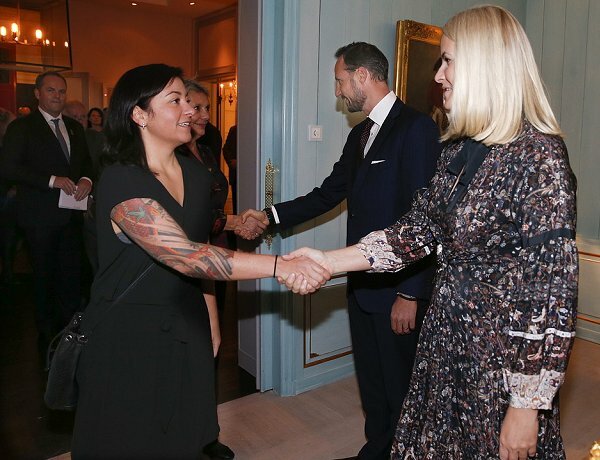 On November 2, 2016, Crown Prince Haakon and Crown Princess Mette-Marit of Norway held a banquet for prison officers, probation office employees, correctional service officers and ex-inmates at the Skaugum estate in Asker, Norway. There are 17 probation office in Norway. Probation offices are responsible for the implementation of community sanctions. Oooohhh Mette Maritttt....I really hope, she soon find the best fashion consultant, the best nutrisionist, and the best personal trainer. Not imagine she bevame a queen with a bad appearance like now. Her dress style is getting worse. Maybe she doesn't have the budget for new clothes for every event but she must have other things that she wore before that were not so ugly, frumpy, or inappropriate. Maybe she's gained weight and they don't fit anymore. Mind you, a bad style or appearance doesn't mean she can't be a good queen. @ Lizzie, as I remember I read that Mette spends plenty of money on clothes. I agree they don't look very often nice but nevertheless they can be quite expensive. And yes she is getting fat! Mette Marit has a personal trainer, and she likes very much to go skiing. And by the way; she looks great and fresh i real life. @ Geir M M. are you her lawyer! reception on the Royal Yacht. I have say greeted Kronprice Håkon. Have also sayed hello to princsess Martha Louse. I do not understand what is going on with her. Perhaps she is really not feeling well? Chronic pain can make you so miserable that it takes much effort to do anything much less dress. I understand Maria. Some clothes don't do her any favors! But I still love her! I love her too M Hall. That's why, I really want her to get some help. What I don't understand, where does she get these hideous chlothes from? Somebody must sell it to her. Does she order online and refuse any advice? I used to sell fashion and never ever would a customer have walked out of my shop like this! And this is not a question of price, you can dress better on a lower budget. Considering her back pain - she should work on her posture, the bad posture she has does add to the back problems. I am sure a good physiotherapist could help, also doing some yoga and breath work. I start to think, although she seems to be a nice person, that she has problems on many levels. I doubt that she is ready to take over the responsibilities that come with being a queen, which means to represent a country, a nation. This is one of those times when Haakon should have spoken up and suggested that she wear something else. Somebody, seriously anybody should have said something. I'm genuinely curious to know what Haakon thinks about his wife's bizarre sense of fashion. It's like the older she gets the worse her style becomes. It's all frumpy dresses and mismatched items that have no business being worn at the same time. This is really what I ask myself too. Does really nobody speak to her, her husband, her mother-in-law? counselors? I don't get it. Because let's see how it is: the royal families are not private, they are doing representative jobs for their country, and that's what they are payed for(only they are not elected but owe the job through heritage). This does not mean you have to be dressed up very expensive all the time, except gala dinners, but you should at least have a proper appearance when you are on duty, fitting to the occasion. This is what would be expected from a simple employee representing a company. Why not from a crownprincess representing her country? Honestly, I don't get it. I think it is time for her to hire a stylist or get a new one! She has a very good clothing budget so money is certainly not an issue as evidenced by her pricey Valentino pieces. She just needs a little help in getting herself together. Little house on the prairy but in norway...when your mother in law is more fashionable abnd more looking young than you it should ring a bell....please please please get a stylist!!!!! She looks more like a hippie than a princess. what is this, with the right clothes MM is a beautiful lady, but with this dress she is a hippy, nothing for a princess. All has been said (written). Her sense of style is deplorable.